For most children, a well-earned summer vacation is about to begin – but for others the warmer months mean learning and playing catch-up with school work. Math is a particularly common subject for summer revision, and this often comes from a lack of basic knowledge and understanding: since the invention of the calculator, ‘mental math’ has been going out of fashion. 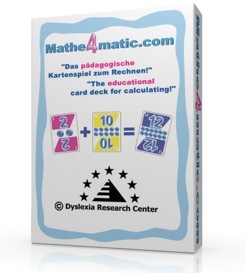 The innovative new card came from mathe4matic.com aims to put things right with its specially-designed deck of forty-eight colored cards and four Jokers which can be used for a variety of arithmetic-enhancing games. What makes the cards particularly unique is the idea of having 3D representations of numbers alongside similar 3D representations of quantities. Qualified experts in Dyslexia and Dyscalculia have also put together great instructions for games to play everywhere from the classroom to the beach – games which are sure to get everyone young and old involved. These playing cards, from the renowned Viennese manufacturer Piatnik, will be shuffled and dealt time and time again: laughter and fun is guaranteed each time! The First Austrian Dyslexia Federation (EÖDL) has awarded the game its Seal for being especially valuable for children with Dyscalculia and/or poor arithmetic. Now summer can begin – but only when the towel, sun cream and Mathe4matic playing cards have been packed!